At the recent launch of Kate Bell & Declan Gaffney’s report on the ‘nothing for something’ benefits system, Richard Exell of the TUC asked if people had become more sympathetic to tax-dodging at the same time as they’ve become more hostile to people on benefits? In an unlikely attempt to impersonate a 21st-century academic, I managed to carve out the stats and send them to the chair of the launch while watching the rest of the webinar – but aside from the surprise that my multitasking skills were up to this (usually they’re not…), I thought it was interesting to share the figures on the blog, particularly given the storm over a Treasury Minister describing cash-in-hand payments to avoid tax as ‘morally wrong’. So have we actually become softer on tax-dodgers – at least before the tax-dodging furores during the latest recession? The starting point for any discussion about tax attitudes is: on a very general level, people believe that they have a moral duty to pay taxes. To look at attitudes to taxation, I’ve dug out the relevant questions from the British Social Attitudes survey, which is generally seen as the gold standard for looking at attitude trends since its birth in 1983. The most recent question (from 2004) asked whether for being a ‘good citizen’, ‘How important is it never to try to evade taxes?’ On a 7-point scale where 1 is ‘not at all important’ and 7 is ‘very important’, 64% gave a ‘7’ and 88% of people at least reported a ‘5’. 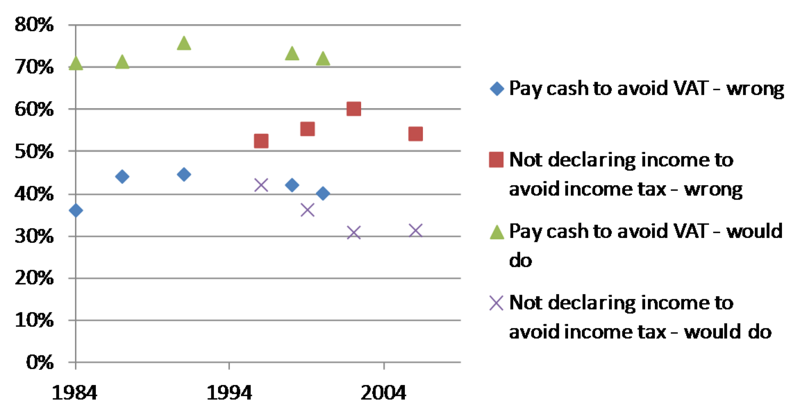 There’s also no sign that that this has gone down over the 1990s according to whether people feel it is wrong to not report all of your income in order to pay less tax (see the figure below). Likewise over the 1980s, three-quarters thought that people ‘should not be allowed to get away’ with avoiding their full income tax (rather than ‘good luck to them if they can get away with it’) – and this changed little 1983-1989. (If anything, people were MORE likely to say this shouldn’t be allowed). 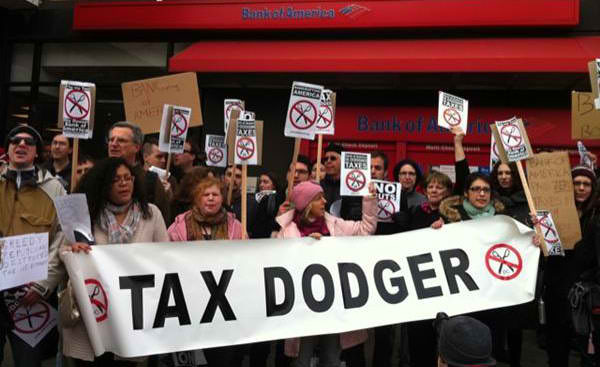 While tax dodging in general is seen as morally wrong, people excuse what are seen as ‘milder’ forms of tax-dodging. There are two forms of this that the British Social Attitudes survey covers. Firstly, people think that being paid in cash to avoid income tax is slightly excusable. 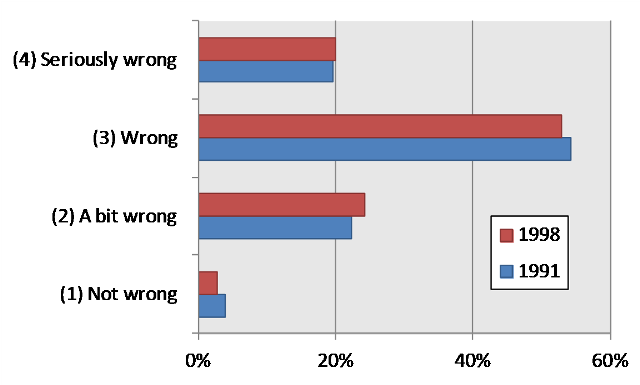 In 2006, 54% thought this was ‘wrong’ or ‘seriously wrong’, while 46% thought it was ‘not wrong’ or only ‘a bit wrong’. So more people are against it than are for it (and only 12% said it was ‘not wrong’ at all), but clearly attitudes are more split than in the case of general tax-dodging above. Secondly, people think that paying someone in cash to avoid paying VAT (sales tax) is even more excusable. The latest question was in 2000 and asked about paying a plumber in cash to avoid VAT: 40% said this was ‘wrong’, ‘seriously wrong’ or ‘very seriously wrong’ (note the wording change from the last question), while 60% said there was ‘nothing wrong’ or ‘only a bit wrong’. For the question, “A local plumber does some of his business for cash and does not declare it for tax. Over a period he avoids paying £500 to the Inland Revenue. What do you think … nothing wrong OR very seriously wrong?“, 78% thought this was ‘wrong’, ‘seriously wrong’ or ‘very seriously wrong’. For the question, “A householder is having a repair job done by a local plumber. He is told that if he pays cash, he will not be charged VAT. So he pays cash. What do you think … nothing wrong OR very seriously wrong?”, 44% thought this was ‘wrong’, ‘seriously wrong’ or ‘very seriously wrong’. In other words, taking significant steps to avoid taxes is seen as very wrong – but not informing the tax authorities about extra work is seen as not quite as wrong, and dodging VAT is (on average) not really seen as wrong at all [You can see something similar in Pattie et al’s report (p48/9)]. Moreover, while only 36% of people said they be ‘very likely’ or ‘fairly likely’ to avoid telling the taxman about £500 of cash-in-hand earnings (in 1999), as many as 73% said they’d pay a plumber in cash to avoid being charged VAT – a point I return to below. So has there been any change in attitudes to taking advantage of cash-in-hand payments to avoid tax? The chart below shows the results – and basically there’s been little change to attitudes or actions around paying cash to a plumber to avoid VAT. For not declaring income tax there’s been a little more movement, but this is in contradictory directions: the view that this is wrong peaked in 2002, but was little different in 2006 than 1996. People’s stated likelihood of doing this, though, went down consistently (from 41% in 1996 to 36% in 2006 saying they were ‘very likely’ of ‘fairly likely’ to not declare £500 of cash-in-hand work). It’s interesting to see how attitudes to tax dodging don’t seem to have shifted, while attitudes to benefit claimants and particularly benefit fraud have changed substantially (as we’ve previously catalogued on the blog – see here and here). This confirms what we already knew from Charlotte’s fascinating post – ‘attitudes to inequality and poverty’ are multifaceted, and some parts of these attitudes can become more progressive while other parts stay unchanged. This entry was posted in Blog posts and tagged public opinion, taxes. Bookmark the permalink. Interesting… I would suggest that part of the answer lies in perceptions of relative wealth and the ‘politics of envy’. For example, both tax evasion and tax avoidance by those perceived as wealthy is seen as especially heinous, presumably because people take the view that they should pay their way according to their means and are also envious of their wealth. However, tax evasion by people of average means, especially when the amounts involved are relatively small, may be seen as ‘people doing their best to survive’ rather than ‘people failing to pay their way’. The issue about attitudes to benefit cheats/scroungers is an interesting one, and I suggest that much of the change in opinion is based on some particularly sensational media reporting, eg of people claiming disability benefits when apparently taking part in active leisure pursuits, and of large, often immigrant, families being housed in large homes in wealthy areas. The fascinating issue about perceptions of benefits cheating in particular is that people assume such behaviour is much more widespread than it actually is. When people use such reports to justify their beliefs, I usually point out to them that even if there was one such case reported every day for a year, that would only amount to 365 cases out of many hundreds of thousands of claimants. There is some psychological process going on whereby people see one high profile report and instantly assume the numbers of such cases are far, far higher than they really are. Hence sensational media reporting has a very powerful effect on attitudes… and if cleverly utilised by politicians can be used to justify unwise and ill-thought-through policies which hurt those genuinely in need of support. Thanks Jane – I agree entirely. We’ll have more on the blog about the media’s role in driving attitudes to benefit claimants later in the autumn.